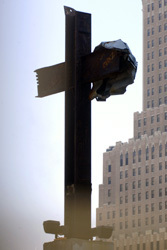 A cross made of steel beams from the wreckage of the World Trade Center sits at Ground Zero. NEW YORK (UMNS) — The Rev. James K. Law knows what it is like to live in the shadow of the Sept. 11 terrorist attacks. 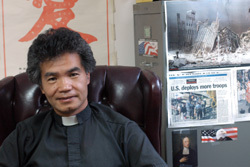 The pastor of the Chinese United Methodist Church in Chinatown ministered to rescue workers at Ground Zero, dealt with church members suffering from trauma and temporary displacement from their apartments, and watched the economy of Chinatown fall apart. But he also was impressed by the response of his fellow United Methodists to the tragedy and appreciated the financial assistance that allowed his church to help Chinatown residents. In the five years since the attacks, United Methodists have completed recovery efforts from Ground Zero to the five boroughs of New York City to New Jersey and Virginia, to the rest of the United States and beyond. The nature of the disaster called for a different type of strategy, according to the Rev. Paul Dirdak, chief staff executive of the United Methodist Committee on Relief. 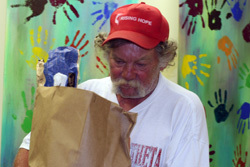 Charles Hicks helps out and receives help at Rising Hope United Methodist Church. The immediate response included volunteer-staffed “listening posts,” where people could share their fears and concerns, and a temporary set-up for direct aid. That assistance expanded into case management programs, counseling, emergency food aid, legal aid and advocacy for immigrants and training in disaster response. A total of 87 grants were given by the New York Annual (regional) Conference to local church projects ranging from after-school programs to interfaith dialogues to pastoral support. “We tried to add a religious dimension and a charity dimension (to recovery),” said the Rev. Charles “Chick” Straut, program administrator for the conference response. On a national level, United Methodists funded trauma-response training through Church World Service; sponsored training for child-care workers; supported local Muslim-Christian dialogues through “Honoring Our Differences” grants; and gave additional money to UMCOR’s “Justice for Our Neighbors” immigrant assistance network. The Rev. James K. Law talks about his experiences in the wake of the terrorist attacks. Internationally, funding was provided for projects in Afghanistan and for Afghan refugees inside and outside the country, as well as for peace-related projects in Nigeria, the Philippines, Pakistan and West Africa. Some United Methodist regional conferences, he added, were so enthused about the “innovative thinking” of the Afghanistan response that they made extra contributions for that work, along with other humanitarian agencies. “The $2 million we spent in Afghanistan has since become $10 million of Afghanistan work,” Dirdak said. The denomination raised $20.8 million after the Sept. 11, 2001, attacks through UMCOR’s “Love in the Midst of Tragedy” offering, to assist with recovery. Funds allotted to the church’s annual conferences for recovery programs included $4.5 million to New Jersey, $1.1 million to Virginia and nearly $2.6 million to New York. Nearly $5 million was spent on UMCOR case management in New York City. 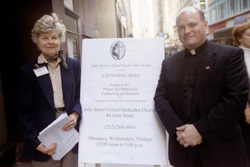 Sally Moran (left) and the Rev. Brad Knepp served as volunteers at a "listening post" that operated at John Street United Methodist Church following the attacks. In total, money spent included $14.4 million for local response; $1.02 million for national response; and $5.3 million for international response, according to UMCOR. Recommendations will be brought to the agency’s board of directors for the remaining $202,289 that has not been earmarked for a project. In-kind donations, valued at $783,000, also were collected. Health and school kits from a 40-foot container were distributed in New York and another container was sent to Afghanistan. Dirdak said the agency was so successful in implementing some “big new ideas” in its 9/11 response that the practices “are now part of the basic understanding of what UMCOR does.” Before 9/11, for example, the agency conducted case management training through the annual conferences. Since then, conferences have been encouraged to create their own social service systems for case management. “I don’t think our major operations in (Hurricane) Katrina would be happening today if we hadn’t had a good experience with 9/11,” Dirdak said. In New York, more than 5,000 families were assisted over the course of three years using satellite offices in churches for case management. This operation “allowed us to see and touch excellent, but small, disaster-response organizations,” said Dirdak. 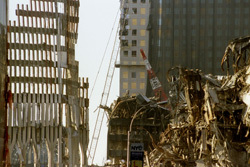 Right after the attacks, bits of steel structure were all that remained of the World Trade Center complex in lower Manhattan. The emphasis in Virginia was to strengthen existing ministries, “kind of a holistic approach,” he said. In New Jersey, the terrorist attacks also affected middle-class families not accustomed to asking for help “who suddenly found themselves unemployed and just didn’t know what to do,” Hazelwood added. The Rev. Ken Sloane, who wrapped up the case management program of the denomination’s Greater New Jersey Conference, believes the program was successful because it did not just dispense funds, but it led people to recover. “I think there was a sense that healing happened and we were a part of that,” he said.